Travel Costs > How Much Does a Hotel Room Cost? How Much Does a Hotel Room Cost? 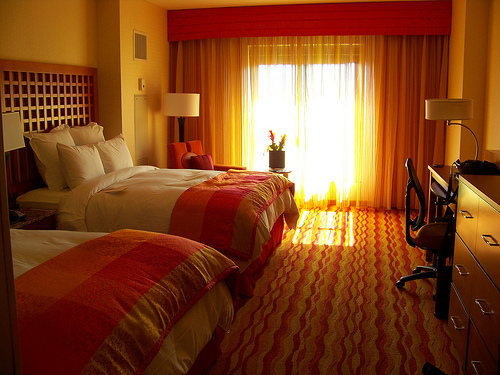 When traveling long distances or for an extended period of time, a hotel stay is usually necessary. Hotel prices can vary greatly from city to city and based on the quality of the hotel. Because hotel rates can also rise and fall with the latest economic trends, it is best to use sites such as Travelocity or Expedia to get current prices. On average, a hotel night can cost anywhere from $50 to as much as $500 a night. Hotels pricing will be based on the star rating, geographical location, time of the year, size of the room, hotel brand and more. Some lower-end hotels will cost as low as $30-$50 per night. For example, the Days Inn in Livonia, Michigan, has rooms containing 2 double beds for $39.99 per night. The same room at the Days Inn in a city such as New York will cost about $149.00 per night. A hotel such as the Grand Hotel on Mackinac Island will cost between $249 and $360 per night per person, depending on the view of the room. Statista.com notes the average daily rate of a hotel room was $120 in 2015. The geographical location will play the biggest role in the pricing. A hotel in downtown Manhattan will cost a lot more than a hotel in the middle of Iowa off the highway. Hotels are going to be classified by a star rating that includes 1, 2, 3, 4 and 5. The higher this rating is, the higher the price will be. The star rating is based on a few factors such as the amenities. A group of organizations will determine this star rating. Superpages.com has an explanation on how the system works. The time of the year will dictate the price tag. In demand seasons are going to cost more than those that aren’t in demand. For example, beach towns may have an offseason that includes the month of November, December, etc. The biggest extra cost for hotel stays is the taxes. This tax is usually higher than the normal tax rate of the state since there is hotel tax imposed as well. If there is damage done to the room in which you are staying, you will be responsible for the cost of repairing the damage. Most hotels charge a fee for any lost keys or key cards. Some hotels, especially those in downtown areas, will charge for parking. There are even some hotels that have only valet parking. Anything extra ordered to your room, such as food or movie rentals, will be charged to you upon check-out. Most hotels will still charge your credit card if your reservation is canceled less than 24 hours in advance. Hotels located in downtown areas may require valet parking or those with limited parking may charge a nightly parking fee. If possible, plan your trip during the week. Weeknight rates are always cheaper than weekend rates. Use services such as Priceline to help you find the lowest price. Priceline is known for its name your own price, where you can name your own price for a hotel room. If the price is low enough, the hotels will accept it. If taking a road trip, try to pick up hotel room books that are located near rest area locations. These books are packed with hotel coupons that can help save you money on your next reservation. Consider looking for deals on sites such as Travelzoo. If you don’t mind making last minute reservations, these sites can help save you up to 70%.